Revolution™ Portion System - For maximum accuracy, this unique ice portioning system counts the number of times the agitator passes the shaver blade. Regardless of the motor load, the correct amount of ice comes out every time! Systems that calculate portions by time or weight may not be delivering consistent drink quality to your customers. Time systems don't reliably shave the right amount of ice because the motor speed will vary with the load (the motor may spin more slowly when the ice hopper is full). Systems that rely on just the weight of ice can be inaccurate during blending because of container movement. The Revolution™ Portion System eliminates these concerns by delivering the right amout of ice every time. Double-Wall Hopper - Insulated for quiet operation and to keep ice cold. 3-Way Sensor Technology - Jar pad sensor prevents operation when container is not in place; hopper sensor prevents operation when lid is not in place. Drain sensor indicates if water is backed up in the drain. This alerts the operator to check the drain line before a messy water backup. 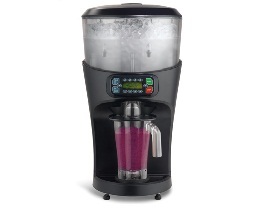 3 Hp Blender Motor - Powerful, heavy-duty, and built to satisfy the demands of the busiest bars. Automatic Cycle Buttons - Let operators select serving size and number of servings for precise results.